The great teacher and invincible defender of the One, Holy, Catholic, and Apostolic Church, Saint Mark, was the offspring and scion of the imperial city, Constantinople. Reared by most pious parents, and instructed in secular and spiritual wisdom, he became preeminent in both. Saint Mark lived as an ascetic on the Prince's Islands and later in the Monastery of Saint George Mangana in Constantinople. 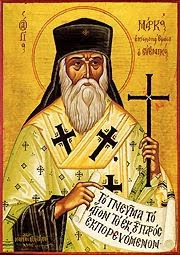 He passed through all the degrees of the priesthood, and was finally advanced to the dignity of Archbishop and the lofty throne of the Metropolis of Ephesus. At the insistence of Emperor John Palaiologos, the Saint was sent to the council of the Latins in Florence, to unite the churches that had been divided for so many years. He astounded the papal teachers with the divine wisdom of his words, and was the only one who did not sign the blasphemous decree of that false council. Because of this, the Holy Church of Christ has ever honored this great man as a benefactor, teacher, sole defender, and invincible champion of the Apostolic Confession. He reposed in 1443. An honorable and wealthy man named Demetrios Zourbaios had a sister who had succumbed to a grave illness. At great cost, he summoned all the physicians of Mesolongion to treat her. However, his sister found no relief, and her condition even worsened. For three days, she was insensible, losing her speech and movement. The physicians diagnosed her as terminal, with death soon approaching. Her relatives began to prepare for her funeral. As this was taking place, unexpectedly, they heard her voice and a heavy sigh. She then turned, saying, "Why do you not change my dress which is drenched with water?" Upon hearing her speak, her brother was filled with unexpected joy. He then hastened to her, asking, "What is the matter and why are you soaked?" She answered, "A certain hierarch took me by my hand and led me to a spring. He placed me in a cistern and doused me, saying, 'Go now, you are no longer ill.'" The woman's brother then asked her, "Why did you not ask the name of him who healed you?" She then answered, "I did inquire the identity of his holiness. 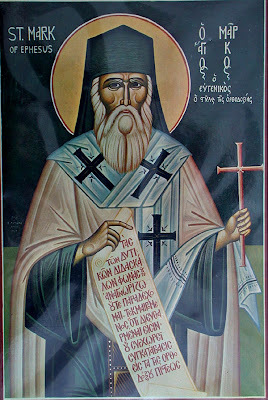 He told me that he was the Metropolitan of Ephesus, Mark Eugenikos." Then - O the wonder! - she arose from her sick bed. All present beheld her soaked garments. Moreover, her bed, bed covers and blankets were saturated. Upon arising, she bore no trace of her former illness. The woman then commissioned an icon of St. Mark be made in commemoration of the miracle. This pious woman lived for another fifteen years and was translated to the Lord. From The Great Synaxarion of the Orthodox Church (January). By your profession of faith, O all-praised Mark the Church has found you to be a zealot for truth. You fought for the teaching of the Fathers; you cast down the darkness of boastful pride. Intercede with Christ God to grant forgiveness to those who honor you! 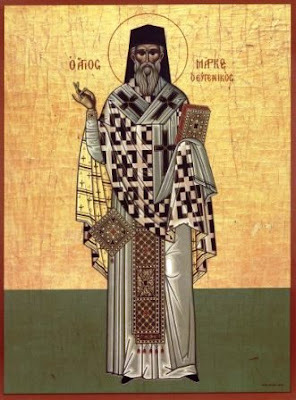 Clad, O godly-minded one, with an invincible armor, thou didst dash to pieces the pride of the Western rebellion; thou wast brought forth as the champion of Orthodoxy, as the Comforter's own instrument and pure vessel. For this cause, to thee we cry out: Rejoice, O Mark, thou boast of the Orthodox flock.